1891: The Irish cycling champion Richard J. Mecredy invents bicycle polo. October 1891: The first bicycle polo match held at The Scalp (20 miles from Dublin, Ireland) with the Ohne Hast C.C. October 1891: The first bicycle polo rules are published in “Cycling” (Ireland). 1895: First English clubs (Northampton, Newcastle, Coventry, Melton Mowbray and Catford) are formed. 1897: First bicycle polo club in the U.S.A is formed. 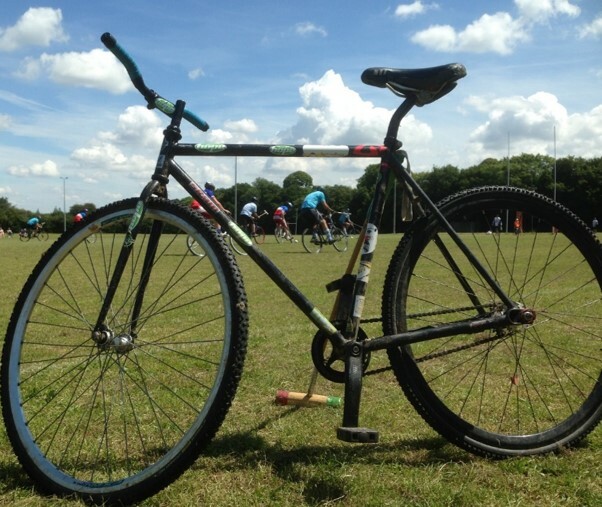 May 1897: The Bicycle Polo Association of Great Britain was formed. The headquarters were in the Sheen House Club (West London). May 1898: The first demonstration of bicycle polo held in France with Captain Wood’s team. September 1898: The B.P.A.G.B. publishes its own rules in “the Morning Post”. September 1901: FThe frst international match between Ireland and England takes place at Crystal Palace. Ireland wins (10-5). 13 July 1908: Biycle polo appears as an exhibition sport at the Olympic Games in London. Ireland beats Germany (3-1) at the Shepherds Bush Stadium. 1914-1918: The first World War stops the cycle polo movement. 1925: Creation of the Polo-Vélo-Club de Paris and the Polo-Vélo-Club Français. 1927: New rules of bicycle polo in France published in the Fédération Sportive du Travail (F.S.T., further Fédération Sportive et Gymnique du Travail – F.S.G.T.). 1928: First championship with teams from Paris and its area (Vitry, Ivry, Clichy, Juvisy, Les Lilas, the “XIIIème”, the “Croissant” and the “Nord-Est”). February 1930: Second incarnation of the Bicycle Polo Association of Great Britain with members of Corrance C.C. March 1930: New rules of bicycle polo (with 8 players per team) inspired by the polo pony rules of the Hurlingham Club and by the hockey rules of the Kent Hockey Association are published in the United Kingdom. June 1930: The first English regional league is created. Referees are used for the first time. New teams are formed including Polytechnic, Adys, Tooting, Merton Wheelers, Corrance, Calleva, Highbury, Centaur, Oval and N.C.U.S.W. Section. 1931: More new teams are formed including Epsom, Norwood Paragon, St. Martin’s, London Bicycle Polo Club, Tunbridge Wells and Imperial Wheelers. Tooting B.C. wins the first championship of England. The London B.P.C. is second. 1932: More new teams are formed including Catford, Clarencourt, Old Portlians and Southborough & District. Tooting B.C. wins the second championship of England. The Norwood Paragon C.C. is second. July 1934: France vs. United Kingdom in Buffalo (France) with the French rules and French players from the V.C. Paris, the A.C. Boulogne-Billancourt, the A.S. Cheminots Est and the U.S. Métro: 9-2 for France. 1933-38: Norwood Paragon C.C. wins the championships of England. 1938: The Bicycle Polo Association of Great Britain has 170 teams in 100 clubs with more than 1,000 players. 1939: 14 clubs in Paris (V.C. Paris, V.C. Français, Pédale Charentonnaise, U.S. Métro, Lutèce Sportif, Clignacourt Sportif…), 6 clubs in Normandy (Joyeuse Pédale Gravillaise, Moto-Vélo-Club Franco-Belge, Club Routier Havrais, Etoîle de Frileuse, Union Vélocipédique Havraise and Vélo-Club Sanvicais) and more in Aquitaine (Talence, R.C. Bouscat, S.A. Bordeaux, Burdigala, U.C. Béglaise, A.S.P.T.T., B.P.C., A.C. Barsac, C.C. Herstal, U.C. Bouscat, Parempuyre, A.S.P.O.M., U.S. Pessac…). 25 June 1939: France vs. United Kingdom in Cipale (Paris, France) with the French rules and French players from the V.C. Sanvic : 6-6. August 1939: United Kingdom vs. France in England with British rules : UK wins 6-1. 1939-1945: The second World War stops bicycle polo matches. 1966 : Creation of the Cycle Polo Federation of India. 1994 : Creation of the Bicycle Polo Association of America. 1996: First International Bicycle Polo Championship organised in Richland, U.S.A., with Indian, Canadian and American teams. India won. First championship in New Zealand. The Victoria University MTB Club won. The Kennetts were second. January 2001: bicycle polo is officially recognised by the International Cycling Union. 2001: The international 4 player set of rules was first used in the 2001 International Championship. 2003: 4 friends meet in the George Pub in Meopham, Kent and believe they have invented Bike Polo. They later discover it has a rich history. 2004: Oakenden Pedallers (later Oakenden Bike Polo) is formed and the first games are played. 2007: Representatives from the French, Irish and British clubs meet in Bobigny, Paris to establish the international 5 player set of rules was introduced for the European Cup, enabling teams using 3 different sets of rules to play each other under a unified set. The inaugural European Cup is played between European clubs. 2007: Oakenden take part in their first “Urban” tournament at Brick Lane, London. 2009: First Town vs Country tournament held at Bike Blenheim festival in Oxfordshire, bringing together the Traditional and Urban teams. Today, bike polo is played in many countries worldwide including Argentina, Australia, Canada, France, Germany, Great Britain, India, Ireland, Malaysia, New Zealand, Pakistan, South Africa, Sri Lanka and U.S.A.